However you spell it or say it (Delia calls it Who Mouse) hummus is one of those things that most people buy from the supermarket because it's quick and easy. And shop-bought is inexpensive too. I've tried making it before and one of my issues was I bought a huge bottle of tahini only to find out that you had to use it within a week. The recipe needed one tablespoon-ful and the bottle contained about twenty times that much. Who wants to make eight gallons of hummus in one week? 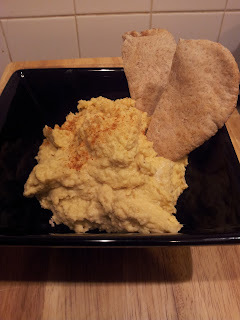 So this time, I just picked the top hit on Google for Best Ever Hummus Recipe and pre-cooked the chickpeas even though the recipe didn't call for it. This time, lovely, smooth (although not supermarket smooth through my own choosing - let's call it rustic) hummus. Not sure about the raw garlic taste - won't be winning many friends at lunchtime tomorrow - and I used a squeeze of lime on top of the lemon as it just seemed to need something else. I also made it in my blender attachment but should've used the food processor instead as too much got stuck under the blades and my blender jug doesn't come to pieces. All in all a good recipe - now I've solved the problem with the chickpeas!